The objective of this study was to evaluate outcomes of endoscopic transsphenoidal surgery using a single-surgeon technique as an alternative to the more commonly employed two-surgeon, three-hand method. Three hundred consecutive endoscopic transsphenoidal procedures performed over a 5 year period from 2006 to 2011 were reviewed. All procedures were performed via a binasal approach utilizing a single surgeon two handed technique with a pneumatic endoscope holder. Expanded enodnansal cases were excluded. Surgical technique, biochemical and surgical outcomes, and complications were analyzed. 276 patients underwent 300 consecutive surgeries with a mean follow-up period of 37 ± 22 months. 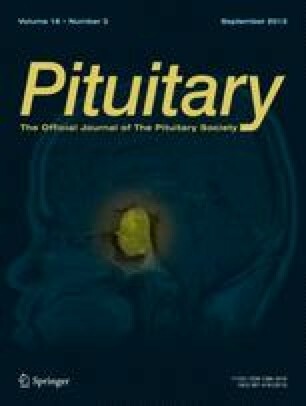 Non-functioning pituitary adenoma (NFPA) was the most common pathology (n = 152), followed by growth hormone secreting tumors (n = 41) and Rathke’s cleft cysts (n = 30). Initial gross total cyst drainage based on radiologic criteria was obtained in 28 cases of Rathke’s cleft cyst, with 5 recurrences. For NFPA and other pathologies (n = 173) gross total resection was obtained in 137 cases, with a 92 % concordance rate between observed and expected extent of resection. For functional adenoma, remission rates were 30/41 (73 %) for GH-secreting, 12/12 (100 %) for ACTH-secreting, and 8/17 (47 %) for prolactin-secreting tumors. Post-operative complications included transient (11 %) and permanent (1.4 %) diabetes insipidus, hyponatremia (13 %), and new anterior pituitary hormonal deficits (1.4 %). CSF leak occurred in 42 cases (15 %), and four patients required surgical repair. Two carotid artery injuries occurred, both early in the series. Epistaxis and other rhinological complications were noted in 10 % of patients, most of which were minor and diminished as surgical experience increased. Fully endoscopic single surgeon transsphenoidal surgery utilizing a binasal approach and a pneumatic endoscope holder yields outcomes comparable to those reported with a two-surgeon method. Endoscopic outcomes appear to be better than those reported in microscope-based series, regardless of a one or two surgeon technique. The authors would like to thank William Gellipis, Lori Korsakoff, RN, and Ilana Litwin for assistance in gathering the data presented. None of the authors have a perceived or real conflict of interest with any of the products or medical devices described in this manuscript.